>Fun Photos of KG KAT AVIARY of Chesapeake, Va. 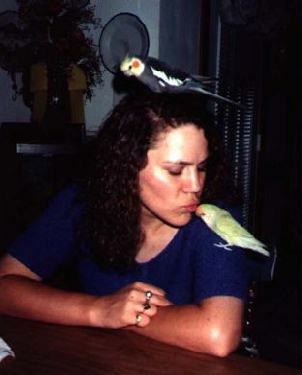 This is Kelly with, our pet lovebird, Jelly and a baby of mine that I sold a year ago. Look at his crest. You have to look close but it's 3/4 up the plate behind him. He has a beautiful crest. His name is Bogie and is owned by the Brideways of Chesapeake. 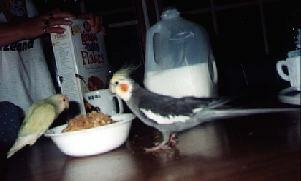 I have the great pleasure of baby sitting him every year and all the tiel pictures in this group are of him. We had such a ball with him. The same three are now getting ready to have breakfest. I always bring by babies to the table to teach them manners. They are taught to take things from the plate but not to step on it. 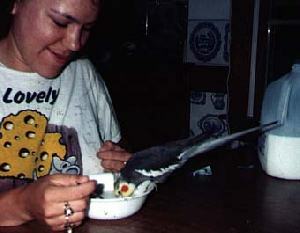 This is a good picture to show how well Jelly can be just as normal as any other bird. Notice he only has one leg. He got his band caught in a toy about a year and a half ago and I had to have it amputated. It's gone all the way to the body. You used to be able to feel a bit of a lump but it's gone now. As you can see none of them eat junk food. HA! HA! This is Bogie, now remember he's been with his owner for over a year and apparently they allow him to step on the edge of the bowl. When the bowl got low enough that he had to stretch for the food he climbed on. He never fell in nor at any time during the week and a half that I had him did he use bad manners. The Brideways have taken very good care of him and trained him well. Bogie is trying to court Tori. He's in love with her. He followed her all over while he was here. 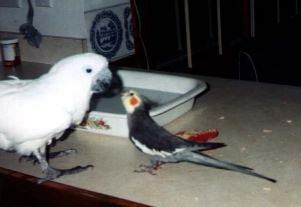 He did the tiel dance across the counter to her and I can just imagine that she's telling him &quot;Hey stupid, I'm a Cockatoo not a Cockatiel don't dance at me&quot;. Tori was good the whole time and tolerated him well. 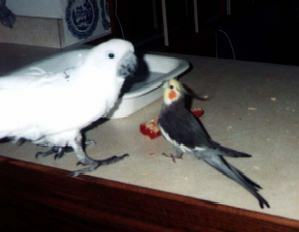 She would open her beak at him but then would just walk away. Here all she wanted to do was take her bath. She missed her shower with me that morning cus I had Bogie with me. Again notice Bogie's crest. I think you can see it better here. Here we (Kelly and I) kept telling her to give Bogie a kiss. At first she wouldn't have anything to do with that but then we were surprised, she did give him a kiss. All Tori does for kisses is lay her beak against your lips so she just touched her beak to Bogies then ran to the other side of the counter. Here's Jelly sleeping in his Birdie Buddie. I disturbed him when taking the picture so his head isn't laid back like it was. With only having one leg he does do a lot of laying. He's so cute. 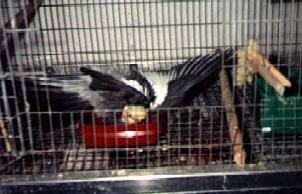 He also has a platform in his cage to rest on. Our vet said to to watch for bumble foot but he lays down so often to rest his foot that I don't think it's going to be a problem. But I do check him over good when he comes to me for belly kisses. He lays in the palm of my hand on his back for these. 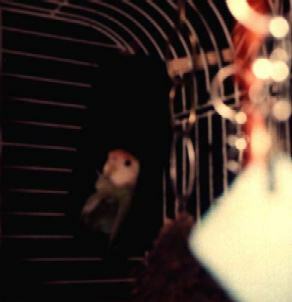 This is Hon our first Tiel pet. We got him when he was 12 weeks old and he's 10 years old now. He was 5 when we set him up for breeding. It was the hardest decision we ever had to make. We were told that once they bond with a female then you totally lose the pet quality and he was such a great pet. I let Kelly make the final dicision cus they had become very close since we had to leave just the 2 of them in Springfield, Va. so she could finish school when we moved down here. He's still a great pet. Any time he's not set up for breeding he'll come to us and do all the tricks and things he used to do. We bring him downstairs to share popcorn and watch tv but after about an hour we see him cocking his head listening for his mate so we know he's ready to go back and we take him back upstairs. He's set up for breeding here and has four beautiful Lutinos in the nest. He's a good daddy, one of my best.